What a wacky wild card weekend! So, to recap from previous predictions, I was on the money with my Sunday picks, choosing the Cowboys to defeat the Lions and the Colts to top the Bengals. But I blundered for Saturday’s games, incorrectly picking the Steelers and Cardinals to win, as the Ravens and Panthers advanced instead. So now, the real playoffs begin, and it’s time for someone to take home the Lombardi trophy. Here are my final NFL playoff predictions including my picks for award winners and Super Bowl dark horses and champions. The Panthers came off a satisfying victory against the Cardinals on Saturday, but they will pose little threat to the vaunted Seattle Seahawks, a team on a mission to defend its beloved Super Bowl crown. The secondary of the Seahawks will stop Cam Newton in his tracks and control the game, with Marshawn Lynch putting the nail in the coffin. Prediction: The Seahawks will win 23-10. The Green Bay Packers are undefeated at home. However, the Cowboys are undefeated on the road. Aaron Rodgers will attack the Cowboys depleted, yet fighting defense. The Cowboys will match it with DeMarco Murray and their rushing attack. This game will get ugly, and ugly means it’ll be unpredictable. I see the upset with the Cowboys shocking the world and taking this game out of the hands of the want-to-be MVP Aaron Rodgers. Prediction: The Cowboys will win 34-30. We have a rematch of week six, where the Cowboys overpowered the Seahawks in their own building. It will be overwhelmingly hostile in Century Link. Not a single blunder all year, not from Dez Bryant, Tony Romo or DeMarco Murray. This will be a grudge match. As they usually do, they will find a way to scratch out a win. Prediction: The Seahawks will win 20-17. The Ravens pose the biggest threat to the Patriots. However, this matchup slightly favors the Patriots simply based off of thirst and experience. The Ravens do in fact have all the pieces in place to accomplish the defeat, however Tom Brady’s greatness will prevail in the end. The Ravens are the dark horse Super Bowl champions, however they are going up against the real Super Bowl champions, and it will play out accordingly. Prediction: The Patriots will win 33-28. Andrew Luck and the Colts are coming off of an impressive defeat against Cincinnati. Despite their record, the Broncos have looked shaky all year and the Colts will put Peyton Manning to the test. This will be a bloody battle, but the Colts will pull this one out. Prediction: The Colts will win 31-27. Tom Brady has yet to reach a Super Bowl since 2011, when his team was defeated by the Giants. Luck will pose a threat, but it will be no match for the Patriots underrated defense. Prediction: The Patriots will win 38-27. Well, I know, it’s the same from my preseason prediction of Pats against Hawks. I think that it is extremely difficult to repeat as Super Bowl champions, especially against a team that has not won a Super Bowl in over 10 years, losing two in the last eight years to the New York Giants. 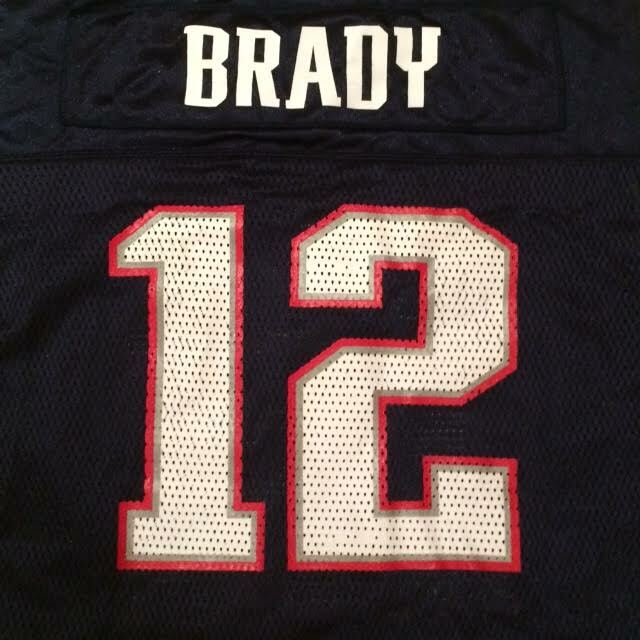 Tom Brady will know what to do against that vaunted Seattle secondary and help his team pull away with the victory. Prediction: The Patriots will win 26-21. What are your predictions? Share them in the comments below. About me: I’m Spencer (Alexander) Zied, a 10th grader from New York, New York. I love to play basketball, football and tennis, and am a big fan of the Knicks, Giants, Yankees, Oregon football and North Carolina basketball teams. I’m also a big fan of First Take and Sportscenter on ESPN. You can email me at spencer.zied@gmail.com or connect with me on twitter, on Facebook, or on Instagram (szied713). Wow. What a crazy season it has been. Who thought it would turn out this way? I certainly know I didn’t. With the season giving us surprise after surprise, there’s no doubt there will be craziness in the post-season as well. As week 17 wraps up, the cold, ragged road to the Super Bowl begins. Here is how I believe it will play out. Cardinals @ Panthers: This one will be a grind-it-out type of game. With two very strong defenses going head to head, we’ll see who packs a bigger punch to seal the deal. Cam Newton will be able to have some fun, but not too much fun as I believe that vaunted Cardinals secondary will definitely impact his decision making, forcing Cam to make mistakes. Lions @ Cowboys: Tony Romo and Demarco Murray have been absolutely phenomenal this season. They have led the Cowboy squad out of the 8-8 doldrums as the seek prosperity for the first time in a long time. Without Ndamukong Suh, the Lions will still have a very strong defense, but with Romo and Murray, the Cowboys attack is too strong. Did I mention Dez Bryant and Jason Witten? Matt Stafford and Calvin ‘Megatron’ Johnson will certainly do some damage, along with the wildcard wide receiver Golden Tate. This game will be fun to watch. Ravens @ Steelers: This division rivalry never gets old. If this were 2012, the Ravens defense with Ray Lewis and Ed Reed would be no match for the Steelers newly high-powered offense. However, those Raven players are gone, leaving the team’s defense weaker. The Steelers have clicked on all cylinders and have been a ‘pick your poison’ offense this season. Joe Flacco will connect with Tory Smith and Steve Smith and will make it interesting. Bengals @ Colts: Andrew Luck has been nothing short of amazing this season. The Bengals have never won in the playoffs with Andy Dalton, and that trend will continue this weekend. The Colts struggle on defense, but Andrew Luck can crank it up a notch on offense to solidify a relatively easy victory. Agree? Disagree? Share your predictions in the comments below. And be sure to check out my Second Take With Spencer A post next week for my divisional, championship, and Super Bowl picks! 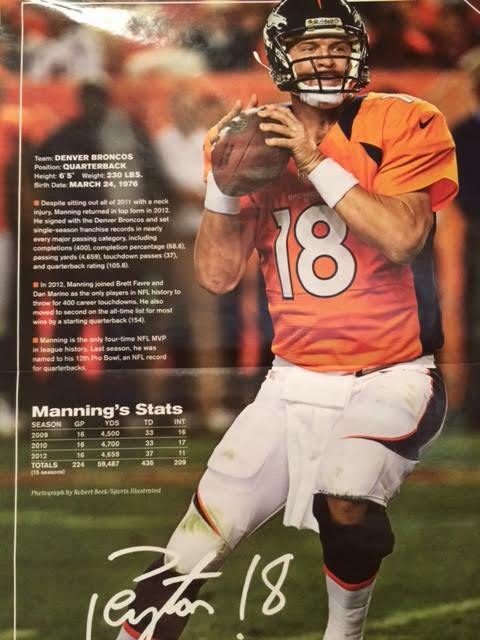 Image of Peyton Manning via Sports Illustrated Kids.